As part of the flight options to Bhutan, I was given the choice to either stop off at Kathmandu, Bangkok or Dhaka on my return leg. I wasn’t aware of any thing notable to see in Dhaka nor was it on the tourist radar. Given my in-laws had roots in Bangladesh and the idea of travelling should be about discovery, I was compelled to dive into the unknown. Dhaka it was then! 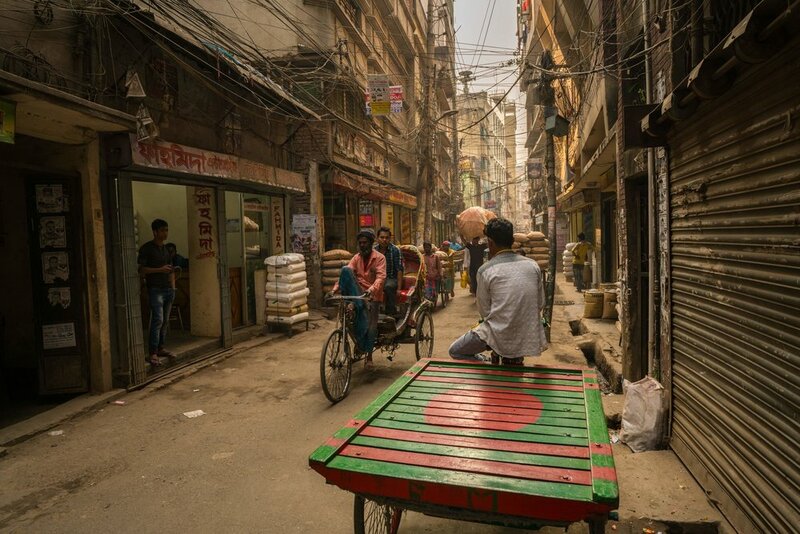 I don’t think I was quite prepared for Dhaka as my mind was still in a state of tranquillity from the laid back Bhutanese culture and the spiritual ambience permeating through me. As I wandered outside the airport, the chaos which ensued was an assault to the senses. I had come from the only carbon negative country in the world to one of the most densely populated place in the world. I admit that even as a seasoned traveller, the change was overwhelming but one of the main traits of a good traveller is the ability to adapt to your surroundings. I gained by bearings and jumped in a taxi to my base for the next couple of days – the Amari Dhaka. The Amari Dhaka is based in the Dhaka’s business district of Gulshan-2 which is less than 20 minutes from the airport. However, be warned as the infrastructure is in development, the traffic can be bumper to bumper most of the time so allow plenty of time when you need to catch a flight. Gulshan-2 is very different from most the districts I had experienced in Dhaka. For starters, all the buildings are behind gated developments and there doesn’t seem to be many pedestrians on the street which was surprising given the density of the population. The advantage being that the location is very secluded to the frenetic world outside. Everyone needs an escape in Dhaka. After a frenzied start to my travels to Bangladesh it was perfect place to unwind at the in-house gym followed by a massage at the friendly Breeze Spa. The food at the Amari Dhaka was one of my highlights. It was impeccable and meets the expectations of a 5-star hotel. I tried the famous Amaya buffet which is very popular amongst the locals. There are distinguished chefs specialising in cuisines from around the world including Italian, Thai, Indian, Japanese, Chinese and even an outdoor barbeque. Whilst on the topic about food, being in South Asia, I have never been that impressed with the desserts but I was pleasantly surprised by the Cascade Coffee Lounge in the Amari Dhaka which offered some tantalising delicacies created by prominent pâtissiers. 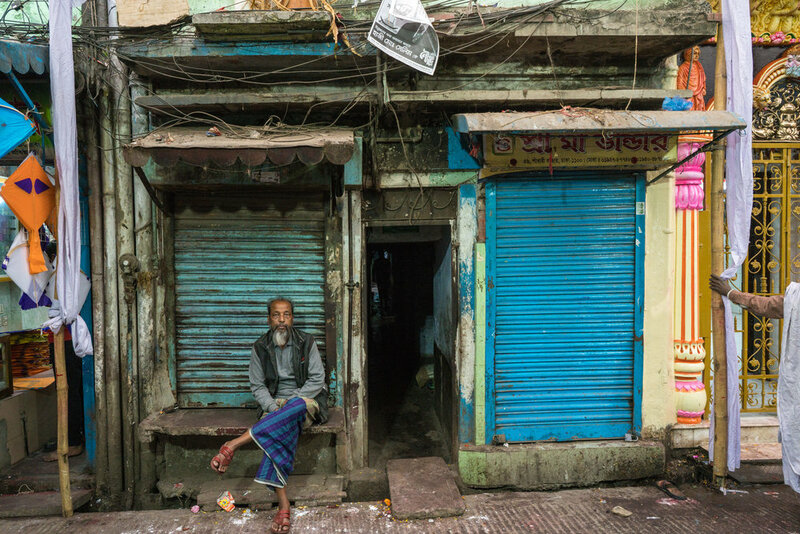 The historic part of Dhaka has over 400 years of history. It certainly looks like it too. The best way to negotiate the narrow streets and watch the world go by is on a rickshaw. It is a street photographers’ playground. The first thing you notice when you get to the waterfront is the foul stench. It will hit you like a brick wall. 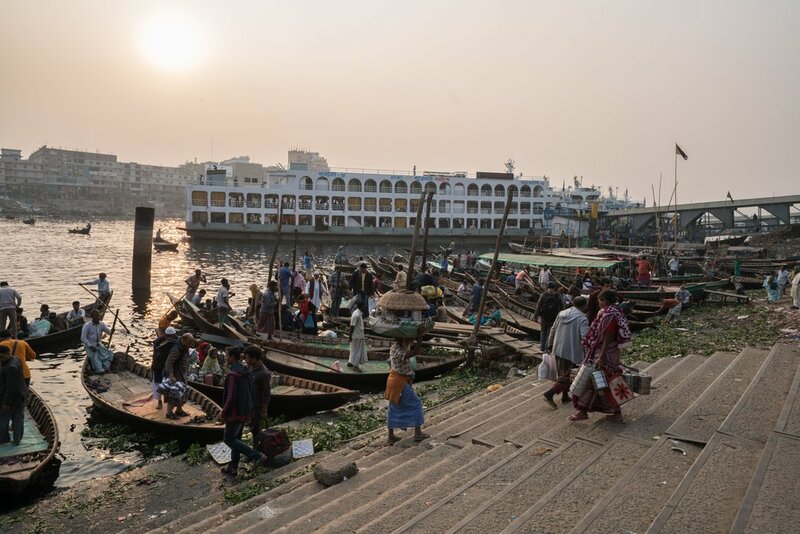 Try and forget about the smell of the Buriganga River and perceive the river as the lifeblood of Dhaka and Bangladesh. Sadarghat is the main terminal where boats or launches depart from. I took a small rowing wooden boat to explore the shores and observed the charming river life – the commuters on their daily river cross and labourers fixing dilapidated ships. This would be eventually my jump off point to the Sundarbans. This even narrower street, is made up of predominantly of Hindus in a largely Muslim city. The street is lined with richly decorated buildings, shops and Hindu temples. The district is buzzing with activity and rickshaws are constantly brushing past you. A real experience for travellers. Not only are the trains a popular means of travel around Bangladesh, they are teeming with characters and interesting subjects framed by vintage rickety trains. Whilst we were enroute to a Tuscany wedding, we decided for a brief stay at Hotel le Fontanelle. Nestled in the middle of the rolling verdant hills of the countryside in the heart of Italy’s Chianti region, it was wonderfully set up for a couple of days to unwind before the festivities. The hotel was a 30-minute drive from Siena through miles and miles of vineyards and cypress trees. Getting there was actually an attraction in itself! The hotel is a bit tricky to find but having made no wrong turns (surprisingly! ), the best advice I can give is to follow the directions provided by the hotel to the letter. Do not rely solely on Google Maps or the satnav. As we admired the scenery, the winding country roads led us up to a prestigious large iron gate which marks the entrance to Hotel le Fontanelle’s 80 hectares estate lined with vineyards and olive trees. Whilst we sat down in the hotel lobby or more accurately described as an elegant Tuscan living room, to wait for our passports to be processed we browsed through the fascinating photo album detailing the history of the gradual but faithful reconstruction of the property. The main part of the hotel dates right back to the thirteenth century and the owner has made sure that as much of the original architecture is maintained around further expansion and renovation plans. We were staying in a suite detached from the main hotel building thoughtfully separated by a botanical garden and a row of typical cypress trees. The kids loved ambling through being surrounded by a kaleidoscope of butterflies and a vast array of flora and fauna. As we were whizzed over in the golf carts to our suite, a storm cloud gathered in the horizon. In any other place we would’ve been disappointed, but the Tuscan countryside is beautiful in any weather. It was hardly tough to look at! The suite we had was spacious even for a family of four. Despite the fact that our quarters were recently built, the rooms exuded the essence of Tuscany and the local traditions with terracotta floors and a beamed ceiling. Being situated on top of a hill, the views from the room of the Chianti valley down below was breath-taking. Naturally, being a hotel set in a vineyard, there are wine tasting tours to experience. However, I was pleasantly surprised to learn that Hotel Le Fontanelle caters for the family too. There are also plenty of activities for the kids such as having a splash in the outdoor and indoor swimming pool as well as free access to mountain bikes to explore the valley. I enjoyed a morning cycle ride along the narrow country roads which evoked memories of my childhood gliding down the hills on my first bike holding firmly on to my hat. After all the driving from Cinque Terre, my wife took full advantage of the Wellness Centre which was fully equipped with a gym, sauna, Turkish bath and jacuzzi. During our stay I was told that there are plans in place to in expand the spa facility too. My favourite experience was just simply sitting on the Belvedere Terrace whether it was for breakfast or for dinner at the "Restaurant La Colonna". The terrace was the perfect setting for an Italian alfresco dining experience with panoramic postcard views of the surrounding Tuscan countryside. I found myself constantly switching between looking up at the scenery and back down at the exquisite food served in front of me. As the sun set and the light cycled through its warm tones in the distance over the rolling Chianti hills marked with lines of cypress trees, I thought to myself “This is quintessential Italy”. When you close your eyes and think of Italy, this is the Italy you see. Upon my return from our second family holiday in Japan, I was asked what I got up to. Among my list, I mentioned SUP in Ishigaki. One popular response was “Where the heck do you do SUP in Japan??”. It seems that many people are not aware of the tropical beach side to Japan in the Ryukyu Islands southwest of Japan towards Taiwan which consist of small islands with idyllic white sand beaches. Even the Japanese perceive Ishigaki as exotic! Given, we had been to Japan before we wanted to punctuate a city break with a beach holiday. There is no doubt it is adding to the travel woes to catch another flight with kids in tow especially when everyone’s still jetlagged but it’s worth it to see a very different and contrasting side to Japan where the locals go for their staycation. With that in mind after a bit of research we settled for Ishigaki. Ishigaki is a a stunning island in Japan's Okinawa archipelago and is the top trending travel destination for 2018 on TripAdvisor. We chose Ishigaki for the family friendly activities, incredible food options and the warm turquoise waters. There are several domestic airlines which fly several times a day to Ishigaki from the major cities in mainland Japan. We departed from Osaka as we were planning day trips from Osaka on our return. The flight would take just under 2 hours from the hustle and bustle. On the day of our outgoing flight, it was grey, dreary and the summer rain lashed down. We dreaded the worst for our mini beach break! June in Japan is considered to be rainy season but we thought we would chance it as it was still technically shoulder season. As we stepped off the plane the first thing that hit us was the humidity. I had to take a moment and question: “Are we still in Japan?”. The contrast in climates could not have been greater. We had left a concrete jungle to palm trees and farms. I was drawn to Ishigaki based on the fact that it was not over developed. There were only a couple of resorts to choose from and most places were not crowded. Ishigaki and its open spaces would be a welcome break. The sun was intense and the heat was stifling. We later learnt that there was a typhoon the week before where it rained for a week. We had lucked out. 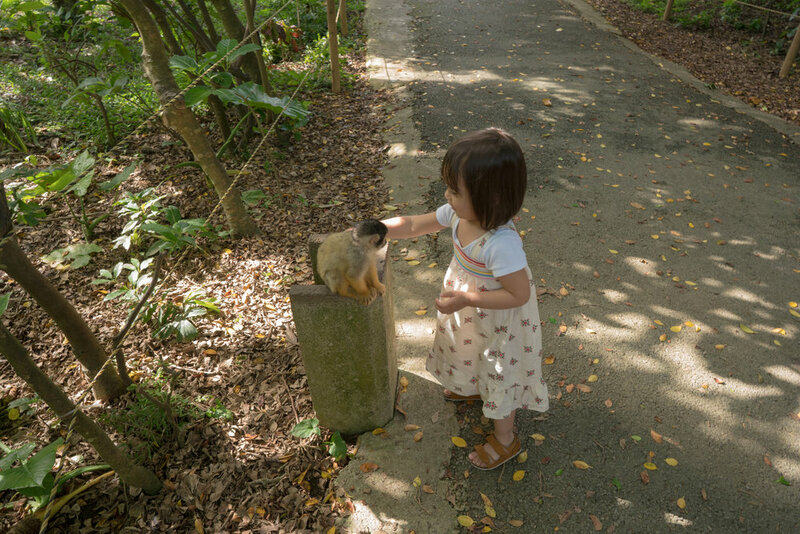 If you are planning to visit Ishigaki, I strongly recommend that you hire a car to explore the island whether you have kids with you or not. Taxis are expensive and the buses are infrequent. The Japanese car hire firms were friendly and efficient although not very proficient in English. Don’t forget your International Driving Permit which you can easily process on the day in most post offices back in the UK. An added bonus is that the Japanese drive on the left too! So with the aircon on full blast we set off for a 30 minute drive to the InterContinental Ishigaki Resort where we were staying for the next 3 nights. The roads were easy to drive, mostly country roads but well paved. I expected nothing less given I was still in Japan after all. The InterContinental Ishigaki Resort was a perfect family retreat. They had really thought out the whole hotel with the family in mind. The classic seafront rooms were a generous size for a family of 4 with small sofa bed perfect for children under 10. The outdoor pool was thoughtfully equipped with floats for children and even a slide. The impressive creche was so immaculate we felt guilty letting our kids run riot in there! Being a father, I actually appreciated the free valet parking which made getting in and out of the car with two toddlers almost effortless. The resort also provides a self-service coin laundry and save on the hotel laundry bill. As I mentioned the InterContinental Ishigaki Resort caters for all the family. Whilst the kids were in the creche for the morning, I signed up to a morning of Stand Up Paddle boarding (SUP) and snorkelling tour. The warm ocean was crystal clear and easily competes with the Caribbean sea. Before we even stood up on the paddleboard, my guide Tomo asked me if I had done this before? Trying to impress him I replied confidently: “No but I’ve surfed once before!”. He looked at me perplexed but politely said that would help! The tour was one-on-one and Tomo had a waterproof camera to take photos of me whilst I concentrated on balancing whilst paddling! I think my guide Tomo was just being nice when he said I was a natural…(I did only fall in once!). We paddled to some reefs and slipped on our snorkelling gear to see the coral teeming with fish and even a few Nemos! It was my highlight of Ishigaki. In contrast, after two flights and not to mention a Shinkansen ride to Osaka, my wife was longing for more relaxing activities. She was delighted with the treatments at the in-house SPA Agarosa and Yoga on the beach at sunrise. Outside of our resort we there were plenty of fascinating sights for all the family. We first set off for Kabira Bay, an enclosed bay famous for its white sand beaches and turquoise waters. The only way to tour the bay is by a glass bottom boat where you can clearly see the coral and sea life without getting wet. It’s perfect for inquisitive kids! Don’t forget to take a view from the observation point for a bird’s eye view of the bay. 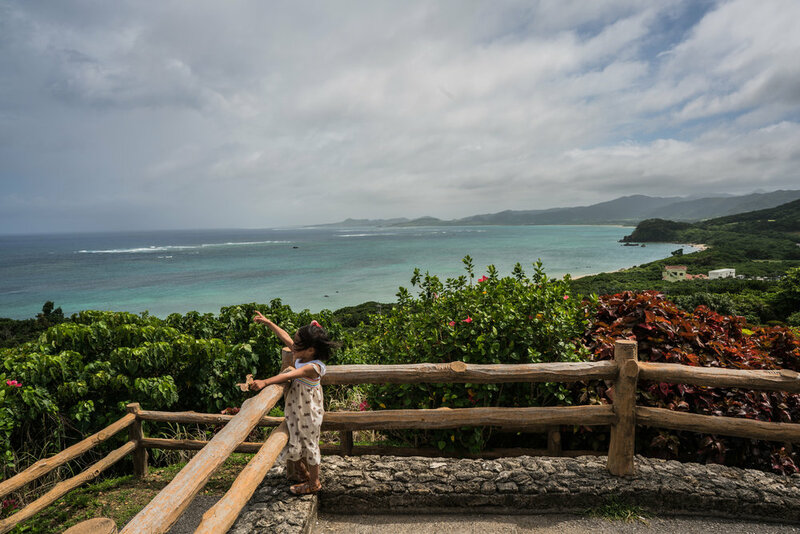 Another unmissable viewpoint on the island is at the Tamatorizaki Observatory Point where you can get a sweeping panoramic view of Ishigaki island. Here you can marvel at the different hues of blues in the Pacific Ocean. For a rainy morning or afternoon, I would highly recommend the Ishigaki Yaima Village, a reconstructed village which showcases the local Yaima culture. Initially, I had my doubts as it looked a bit “Disney” but the variety of cultural experiences kept the kids thoroughly entertained, the highlight being the playful Squirrel Monkeys and the kimono fitting. They slept well that night. It was surprisingly cheap to dine out in Ishigaki given that it was on an island and in Japan. It did not come as a surprise that the sashimi was the freshest I tasted. However, Ishigaki is also renowned for the cattle raised on this little island and the beef it produces. It is arguably even better than the famous Kobe beef. Fortunately, the concierge at the InterContinental Ishigaki Resort had already made lunch and dinner reservations 3 months prior to arrival. I recommend reservations as most restaurants require advance bookings even during the off peak season. My stand out favourites were Hitoshi Ishiganto where I mistakenly ordered a sashimi platter for three persons but still managed to finish it without assistance and Sumibiyakiniku Yamamoto for the mouth-watering tender beef! Our short visit to Ishigaki was a pleasant and relaxed introduction to the Yaeyama islands whilst only scratching the surface of the Okinawa archipelago. For the more adventurous, the neighbouring island Iriomote which is mainly covered in jungles and mangrove swamps offered a variety of active pursuits such as kayaking and canyoning. We gave these a miss until our daughters were a bit older so we will be back! I must admit, Cuba was quite low down in my top ten places to see before I die. However, as soon as I saw US and Cuban diplomats shaking hands on the news and reports of relaxing trade restrictions, Cuba was suddenly propelled to the top of the table! Fortunately, even when travelling through some of most crime ridden cities in the world in Brazil, South Africa and Mexico, I have never been robbed. Here are my tips for staying safe as a travel photographer. Japan was a trip that I had put off for too long. I’ve never been particularly fond of shooting in developed countries, especially ones as developed as Japan, because of the inevitable hordes of tourists. I think it’s safe to say that we’ve managed to refine the art of travelling with young children and I’d like to share some wisdom we’ve acquired along the way. I’ve found paradise and I will share it with you! We are going to die, and that makes me and you the lucky ones…. Looking back over the years of travelling throughout my lifetime so far, I’ve decided to share a few travel tips which I’ve picked up along the way to help enhance the experience and smooth the rough edges whilst on the road. As a traveller it’s important to take advantage of night buses. Not only do they get you from A to B but they also save a nights accommodation expense. My Top 10 travel annoyances!